VIMIC, the acclaimed heavy rock band founded by Grammy Award-winning Slipknot co-founder and heavy music luminary Joey Jordison, has signed a global deal with Universal Music Enterprises (UMe) and T-Boy Records, UMe's label partnership with veteran rock manager Andy Gould. VIMIC's full-length debut, Open Your Omen, is slated for release in early 2018 by T-Boy/UMe. Produced by Jordison and Kato Khandwala [My Chemical Romance, The Pretty Reckless], with mixing and mastering assistance from Megadeth's GRAMMY®-winning Dave Mustaine, the album signals the biggest triumph of Jordison's illustrious career to date, coming to life as he faced his life's most difficult challenge. Diagnosed in 2012 with the often-permanent neurological affliction Acute Transverse Myelitis, Jordison, who was then Slipknot's drummer, spent three months in the hospital and underwent intensive physical rehabilitation and training to not only achieve a full recovery, but to reach a new level of proficiency with his instrument. After emerging from this battle and returning to the stage for a string of festival appearances, Slipknot parted ways with him. Finding a new strength with support from close friends and family, Jordison resolved to get back to doing what he does best. Enter VIMIC: Jordison [drums], Kalen Chase [vocals], Jed Simon [guitar], Kyle Konkiel [bass], Matt Tarach[keyboards], and Steve Marshall [guitar]. VIMIC's T-Boy/UMe labelmate and Megadeth founder Dave Mustaine joined forces with the band for Open Your Omen, lending his multi-Platinum ear and expertise to help with the album's mixing and mastering processes and contributing a blistering guitar performance on the album's lead single. Jordison and Mustaine will both attend the Loudwire Music Awards on October 24 in Los Angeles, where Jordison will present one of the night's top awards. VIMIC will support Megadeth on several South American tour dates starting October 29 in Santiago, Chile, before headlining select European tour dates in November. "This album wails!" says Dave Mustaine. 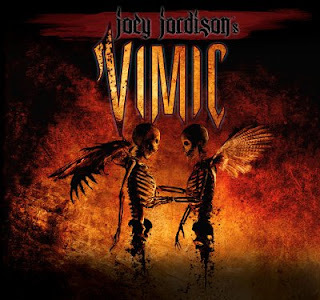 "Joey Jordison and VIMIC are incredible! High octane drumming and heavy, melodic songs make this band something you definitely need to check out! I dig them so much I laid a solo down on one of their songs, 'Fail Me (My Temple).' From there we decided to take them on tour with us down to South Americawhere Megadeth is massive." "The riffs, lyrics, and drums of Open Your Omen will tell you a lot," Joey Jordison says. "We started this record when I was coming out of the Acute Transverse Myelitis condition. It's literally what saved me and helped me get back to where I'm healthier than ever. These guys and this album pushed me to not only relearn how to walk, but how to play the drums again. Open Your Omen is the rebirth of the rest of my life."